Assoc. 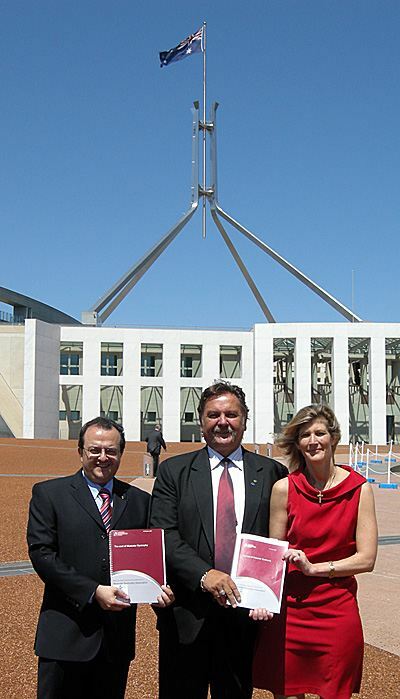 Prof. John Gullotta AMA, Boris M Struk MDA & Lynne Pezzullo Access Economics pictured in front of Parliament House with the Report. 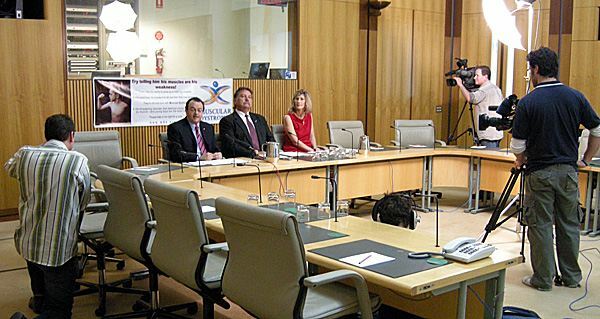 A new report commissioned by the Muscular Dystrophy Association has been released that shows the disease costs the Australian community an estimated $1.5 billion a year. The report, the first of its kind, was prepared by Access Economics and launched by Associate Professor John Gullotta, Chair of the AMA Public Health Committee at Parliament House, Canberra. The Cost of Muscular Dystrophy focuses on the prevalence of muscular dystrophy, the loss of life and well-being and the economic impact of the disorder. ‘Muscular dystrophy’ is the name given to a group of genetic and hereditary neuromuscular diseases characterised by progressive weakness and degeneration of the muscles. There are an estimated 3,457 Australians with muscular dystrophy. The report reveals that the cost of the disease is estimated at $1.5 billion a year, or the equivalent of a financial burden of $126,000 per person affected by muscular dystrophy each year. This figure includes health care costs, aids and equipment, personal care, transport and productivity lost due to lower employment, absenteeism and premature death. It also shows that if all neuromuscular disorders covered by the Muscular Dystrophy Association are considered, the cost would exceed $6 billion a year. Muscular dystrophy also has a case burden three times greater than multiple sclerosis and 10 times greater than diabetes, revealing the Disability Adjusted Life Years per case for muscular dystrophy to be higher than for any other National Health Priority Areas. Muscular Dystrophy Association Executive Director Mr Boris M Struk, highlighted the significant gaps in funding that place financial hardship on families and the healthcare system. “Our fundamental concern is that while the government has adopted a policy of giving priority to selected areas of major health concern, the muscular dystrophy community falls outside these parameters and has become disadvantaged,” Mr Struk said. “At a time when our repeated calls for an increase in services and financial assistance for families affected by muscular dystrophy have been ignored by the government, we have been dismayed by the government’s pledge of $500,000 to Indonesian Orangutans. “I do not know how this can be justified when each Australian family caring for a child affected by muscular dystrophy is facing a $126,000 financial burden,” Mr Struk said. Assoc Prof John Gullotta, Chairman of the Australian Medical Association’s Therapeutics and Health Committees was invited to launch The Cost of Muscular Dystrophy report.